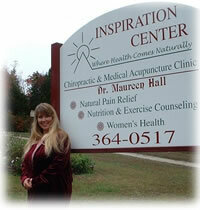 We have worked hard to create an environment at Inspiration Center that promotes healing, wellness, and happiness. We view our patients as welcome visitors and treat them accordingly. These visitors are often struck by the calm and peaceful atmosphere that pervades at Inspiration Center, where healing begins as soon as they arrive. The clinic is an A-frame nestled in the Ozark hills surrounded by woods and gardens, including a meditation garden, with a small pond complete with, fish, benches, and a waterfall. Visitors often stroll through the gardens; relax and meditate, and feed the (very tame) fish.